Did you ever have a picture on your resume? Did you ever want to have a picture on your resume? This template will enable you to realize that aspiration. Resume4Free has several templates that display an image whether it is a picture, photo or a logo. Don't have a picture? No matter, we have built-in logos that you can select and use. If this seems like something you would like to do you may download this template from our creator program. It will be quick to set-up and will be created instantly. 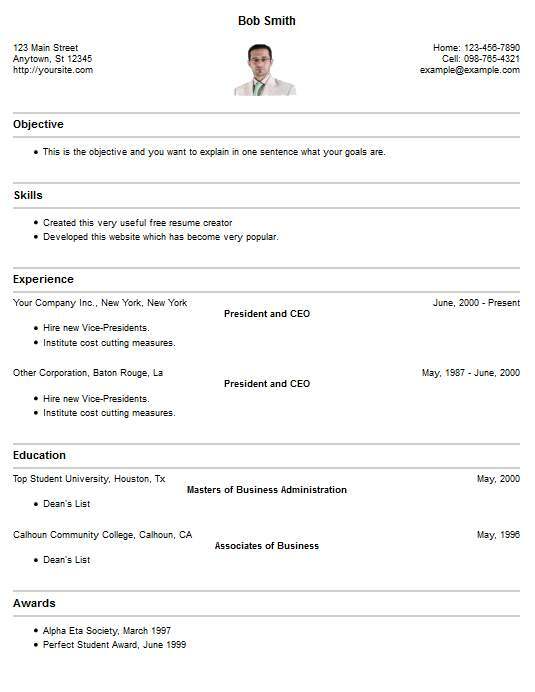 While you are trying new things you can write your resume using this template here, all for free. If you normally write everything manually you can now expedite the process and use our creators to walk you through it. If you need a resume, cover letter, reference page or just some good quality tips and how to's you can find them here at Resume4Free.com. Our services have always been free since 2011. Visit our About page if you would like to find out more about Resume4Free.com, you can also learn how we provide all these free services. Here are a few quick tips that will make your resume more effective and just so happen to be so simple to implement. When writing put your most valuable assets at the top of the page where the employer will be quick to find your best qualities. Of course you will always write using action verbs. Finally, when you write about your accomplishments, etc. be specific. Use numbers and quantifiable facts, e.g. increased sales by 24% within 12 months. For more tips view our help and tips page.